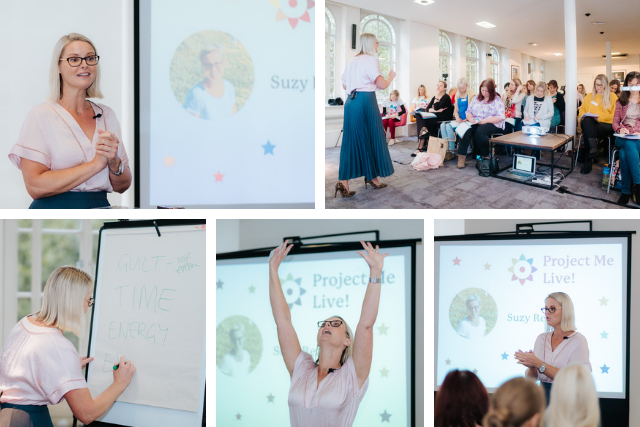 The first ever Project Me Live event took place in London on Saturday 6 October 2018 and brought together an incredible group of women to focus on what is arguably the most important area on the Project Me Life Wheel® – Health & Wellbeing. 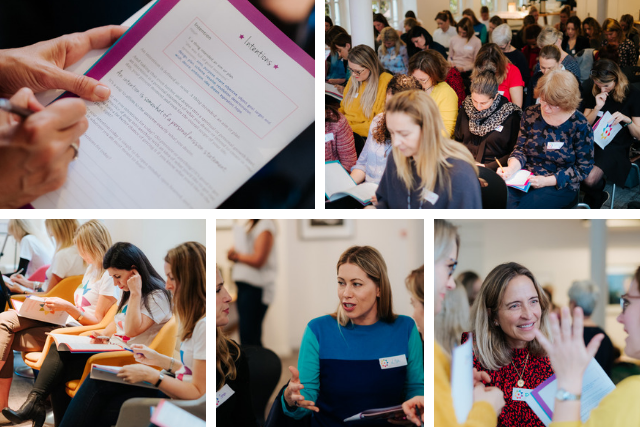 Women travelled from all parts of the UK and Europe to have a full day to focus on themselves and were treated to a carefully curated programme of guest speakers, workshops and activities designed to inspire them into action. 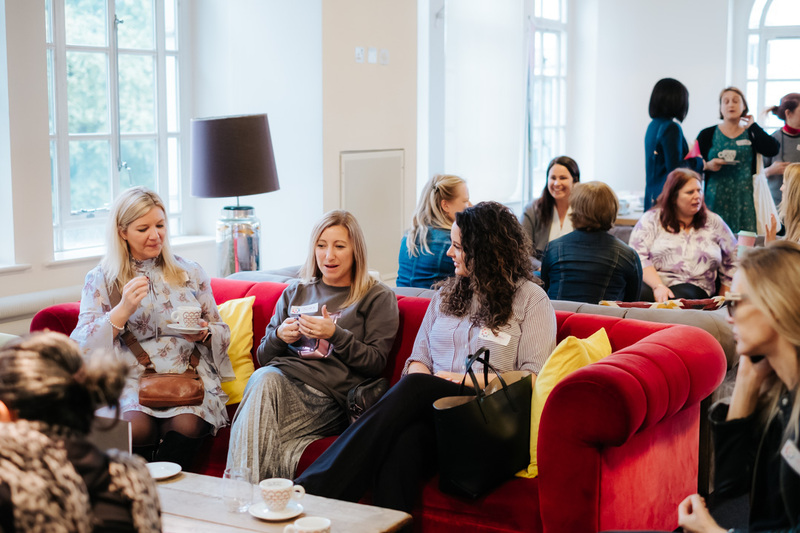 They were greeted by a team of Project Me Goal Diggers who immediately made them feel welcomed into the beautiful light filled private members club, 1 Alfred Place, with plenty of spaces to chill-out and make new connections. 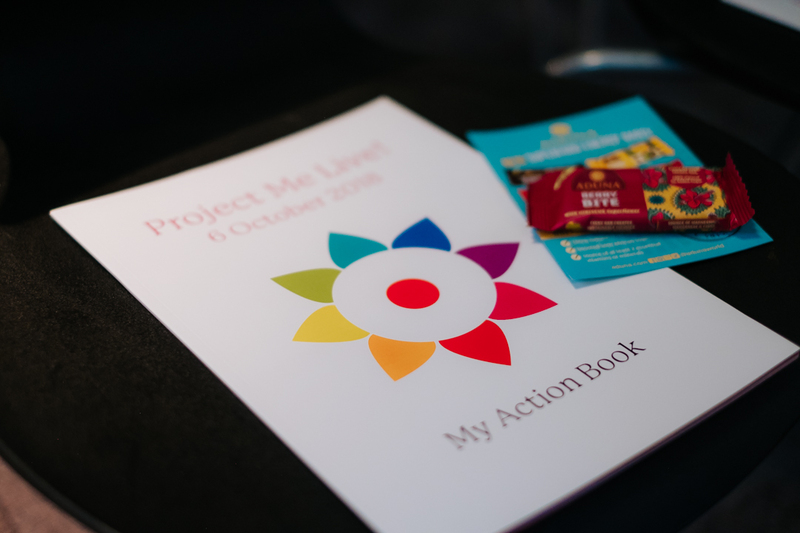 Each seat was prepared with a 40-page Project Me Action Book and an Aduna Superfood Energy Bar which gave everyone a delicious morning burst of energy. 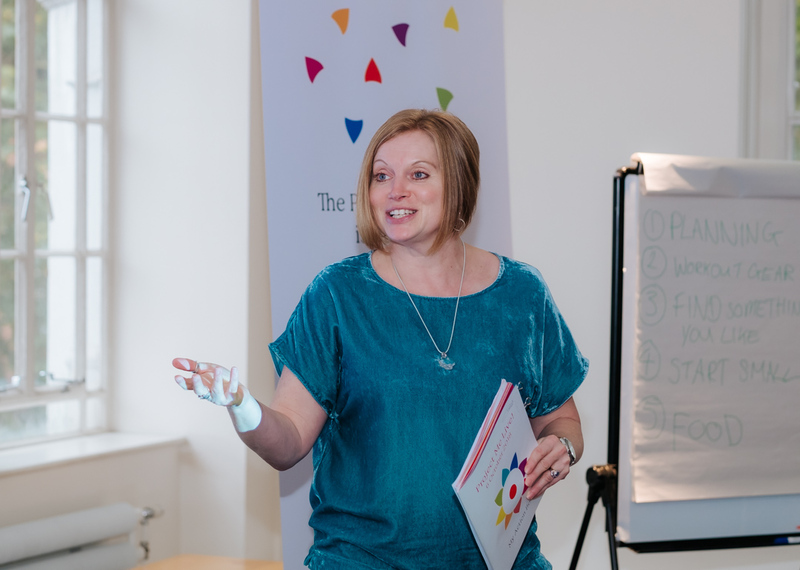 Feisty and funny Leadership Coach, Cheryl Brooker, was our energetic MC for the day, enthusiastically introducing each new speaker, whilst keeping the programme running on time. I can’t thank her enough for her amazing support in making the day flow smoothly! 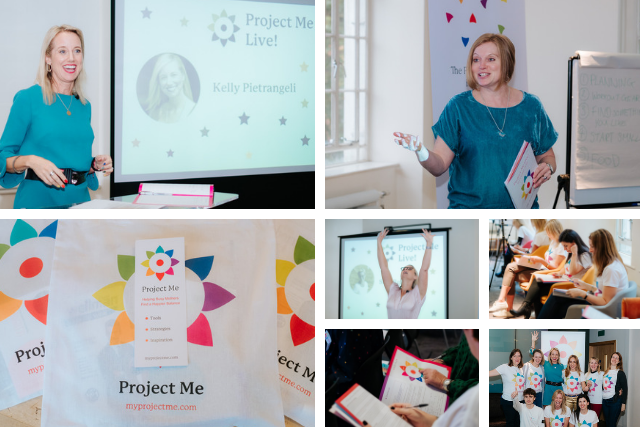 Then the creator of Project Me, Kelly Pietrangeli (yes, that’s me!) took to the stage. I told the story of how wildly out of balance my life used to be until I turned things around by creating my Project Me 10 years ago. I shared my mission to create a global movement of women who are ready to stop complaining about what’s not working in their lives and do something about it. No one else is in charge of your happiness but you. 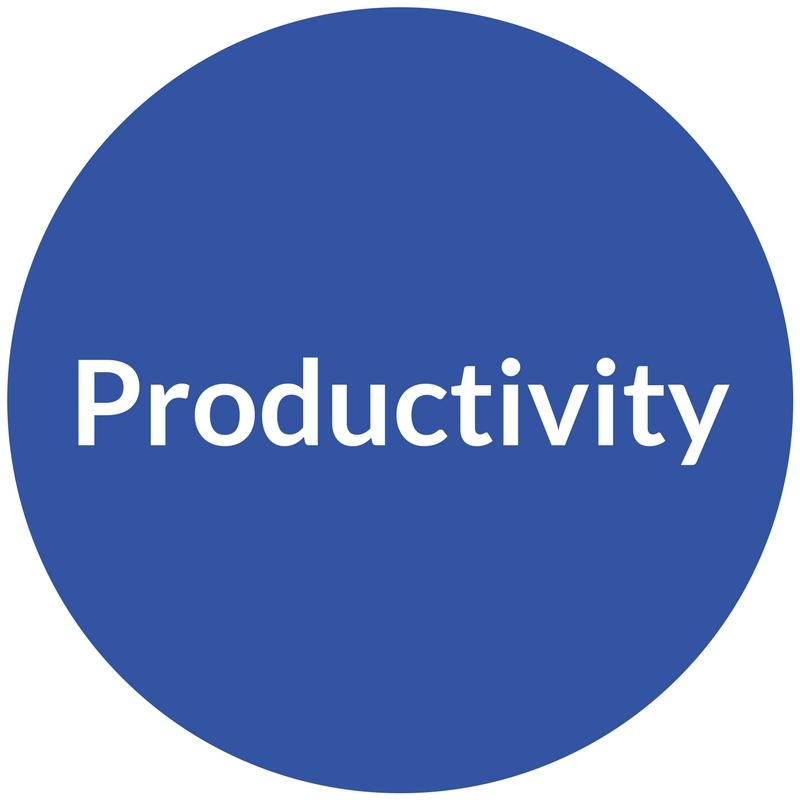 We can sometimes get bogged down by the everyday busyness of life. And when that happens we lose touch with our inner being. 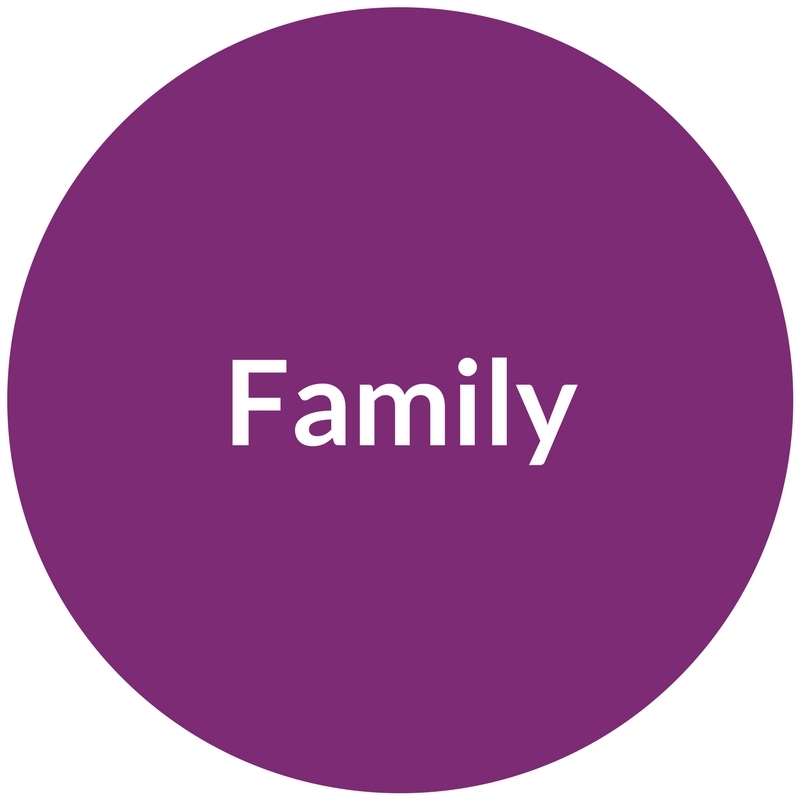 We lose sight of our values and what’s important. 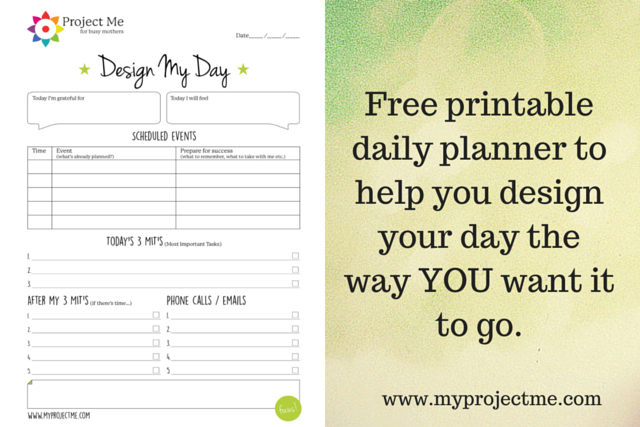 Project Me helps you find your focus amongst the busyness. 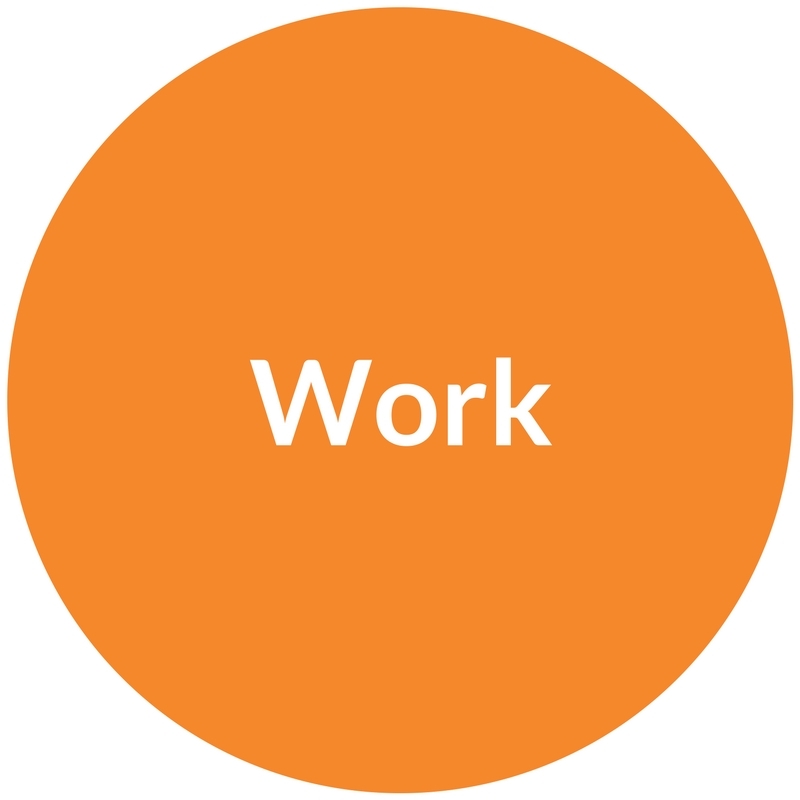 It reminds you that you are the most important project you could ever work on. 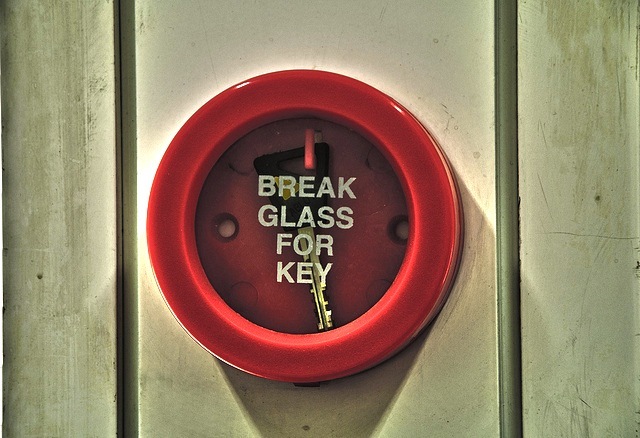 You can’t give what you haven’t got and you must fill your tank so you have more energy to go out into the world and spread your gifts and talents with others. You can’t do that if you’re running around like a headless chicken all of the time. 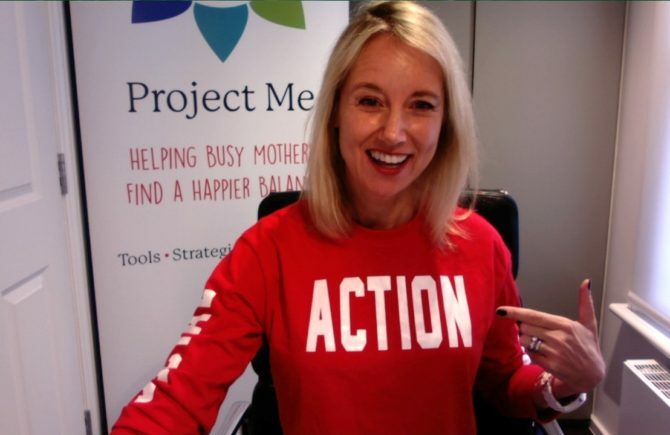 It’s far from selfish to spend regular time checking in with yourself to see where you’re in or out of balance – and that’s what Project Me is about. 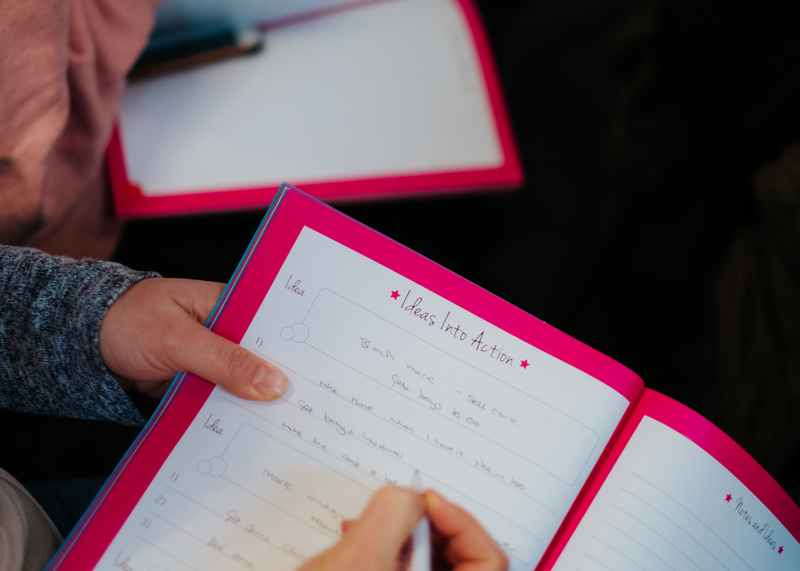 Everyone opened up their Action Books to set their intentions for the day and then shared them with others. Going into anything with a desired intention is the best way to get what you came for. Sharing it with someone else gives your intention lift-off and sets the wheels in motion. I then introduced the new Project Me Health Wheel to help identify which areas of health and wellbeing could use some specific focus. Next, nutritionist Lucinda Miller, aka The Nature Doc, gave us actionable ideas for how to add more nourishment to our meals in easy, doable ways. We learned about reducing inflammation, increasing our omega-3s and treating ourselves to turmeric milk before bed. My own actions include, doubling up on my veggie intake and boosting my meals with a mix of linseed and chia seeds, as well as eating more oily fish. Now it was midday and time for me to lead everyone through my Ideas Into Action process to ensure that key takeaways from the morning sessions were broken down into small-step-actions to be implemented back home. Too often we get a great idea but it gets lost amongst our busyness. 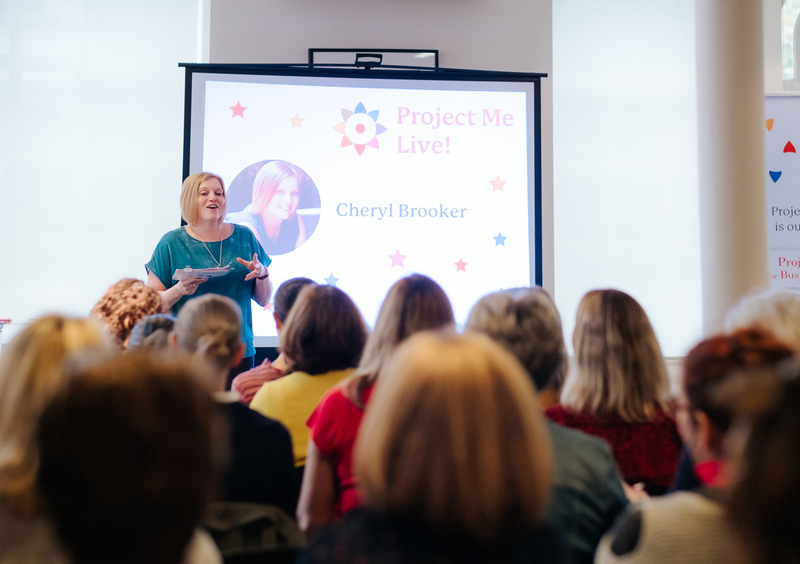 Project Me Live gave everyone that vital processing and writing time that makes all the difference when we want to make positive changes in our lives. Next was a word from our sponsor. 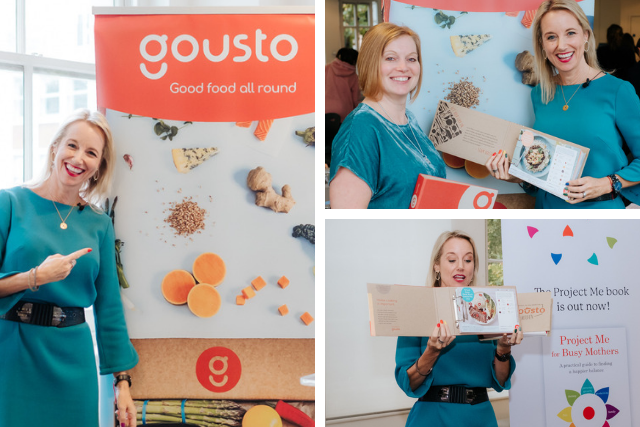 Cheryl and I are both huge fans of using Gousto to help take the hassle out of feeding our families healthy home-cooked meals. Cheryl loves how Gousto brings more variety to their family meals and replaces a couple of unhealthy and expensive takeaways each week. For me, it’s about all of the time I save not having to meal plan and food shop, as well as the fact I serve dinners that actually taste good now that I have all ingredients pre-measured and a simple step-by-step recipe card to follow. Over the lunch break Elizabeth Lawson, Usborne book rep and owner of Liz’s Pop-Up Bookshop, ran our author’s book corner, alongside my son Marco. Suzy Reading and I enjoyed signing copies of our respective books, The Self-Care Revolution and Project Me for Busy Mothers. 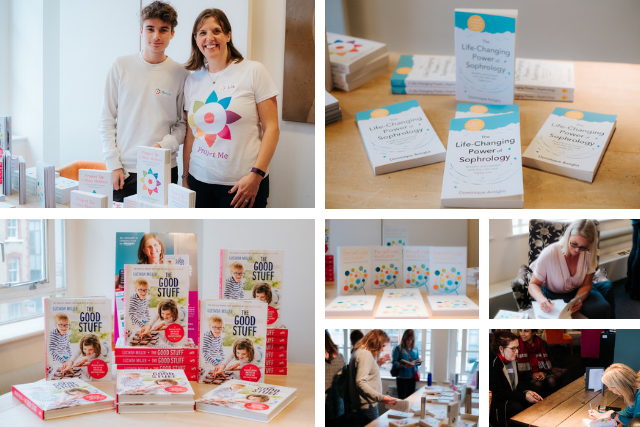 People were thrilled to get their hands on Lucinda Miller’s brand new book, hot off the press – The Good Stuff: Delicious Recipes and Tips for Happier and Healthier Children. We loved meeting many of the amazing women who’d treated themselves to this special day for themselves. 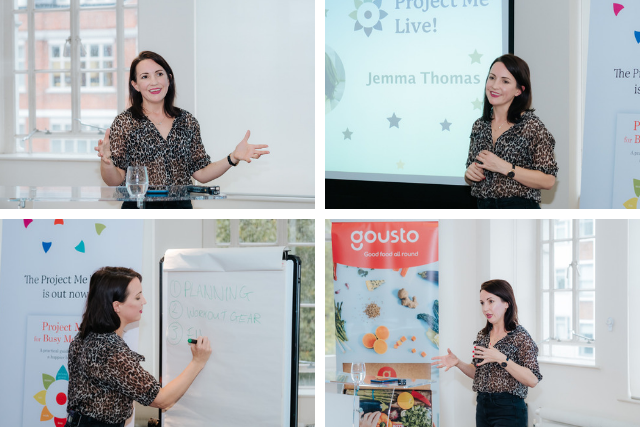 After lunch, Jemma Thomas of Jemma’s Health Hub shared how to fit fitness into your life no matter how busy you are. She helped us realise that even if we can’t get to the gym, there’s plenty we can do at home – including tuning into Jemma’s own 5 minute daily workout at 7am on her Instagram page every morning, Got 5 Live! One of my favourite quotes of the day came from Jemma when she said, ‘You can’t do a “before” and “after” picture of how you feel inside after you exercise.’ Very true. 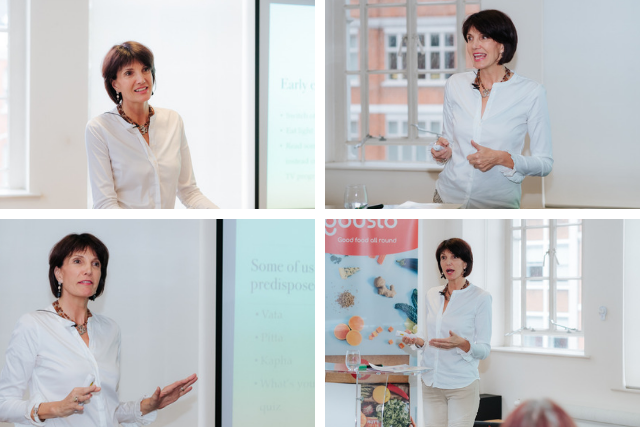 I was excited and intrigued to learn about Sophrology from the delightfully charming Dominique Antiglio, the founder of BeSophro, a Mayfair based Sophrology clinic. Hugely popular in many parts of Europe, but relatively new to the UK, this technique combines Western science with Eastern wisdom to help manage stress, sleep better, and live more mindfully. It’s also used for effective pain management and childbirth. Dominique led us through some simple sitting and standing techniques that left several of us in (happy) tears and made everyone feel utterly peaceful and relaxed. I’m now reading her book, The Life–Changing Power of Sophrology: Breathe and Connect with the Calm and Happy You. We couldn’t have a health and well-being event without talking about mental health. 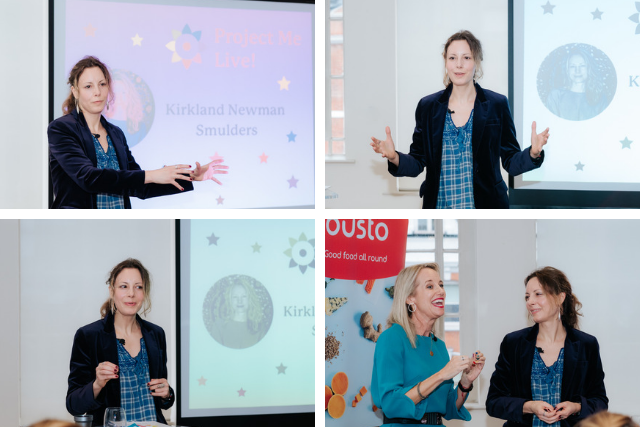 Kirkland Newman Smulders shared her powerful story of overcoming postpartum depression and her mission to bring integrative health to the forefront so we can stop treating the symptoms of mental health issues and treat the root cause. 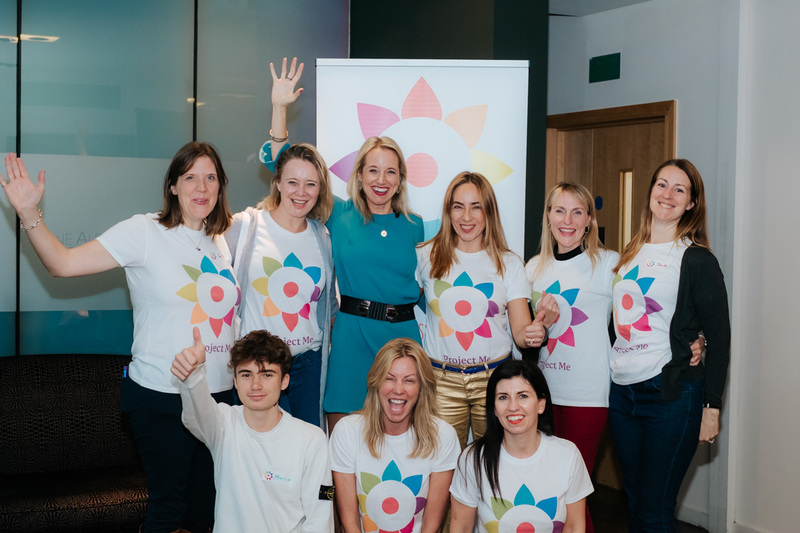 Her new website mindhealth360 is set to be the go-to resource for people seeking advice and help for themselves or loved ones, as well as doctors and practitioners themselves. You’re going to be hearing a lot more from Kirkland, this is only the beginning of her bigger mission. 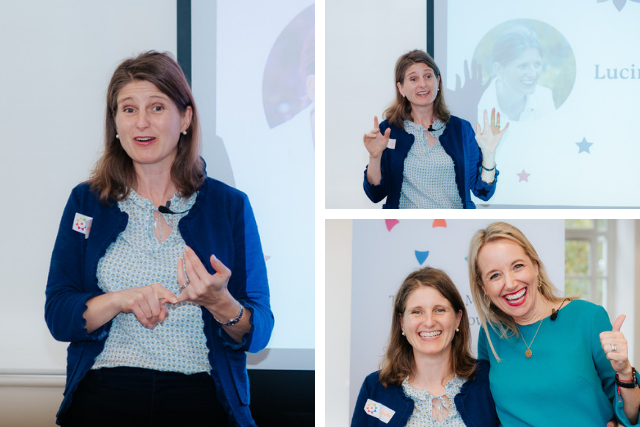 What better final speaker of the day than sleep expert Alison Francis, otherwise known as Anandi The Sleep Guru, who shared her words of wisdom on this important subject. She helped us to realise the vital role that good quality sleep plays in our mental and physical wellbeing. We learned which Ayurvedic mind-body Dosha we are and she encouraged us to create a wind-down ritual which includes shutting down all electronics, putting our legs up the wall to quiet the mind, and anointing our bodies with warm oil. Dreamy! Her book Breathe Better, Sleep Better: How to Use the the Breath to Get a Great Night’s Sleep belongs on all of our bedside tables. Now it was time for me to help everyone to filter down all of their ideas and inspiration of this amazing day and create a solid plan of action. Everyone headed off into pairs with someone they didn’t already know. This was out of the comfort zone of many, but big things happen when we dare to step out of our comfort zones. They each identified a goal they wanted to achieve and then worked through it with their partner who acted as their coach to elicit their own ideas for how to make it happen. We can only become the expert of ourselves when we turn inward and get to know ourselves better. That’s often easier when someone else helps us shine a light on it. I loved walking around and observing the way open-minded women are able to express themselves without ego, and their naturally supportive nature. 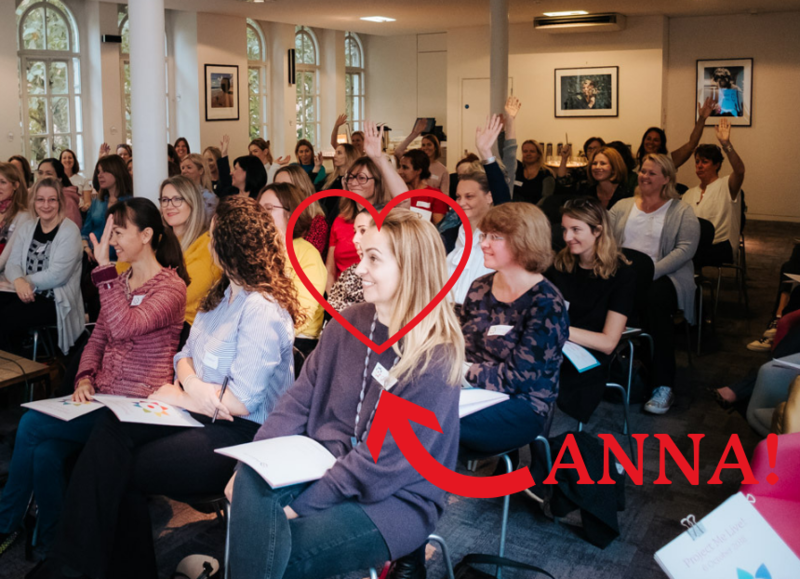 I introduced everyone to my own Power Pal Anna, and shared how having a personal mastermind group over the past 10 years has utterly transformed our lives. 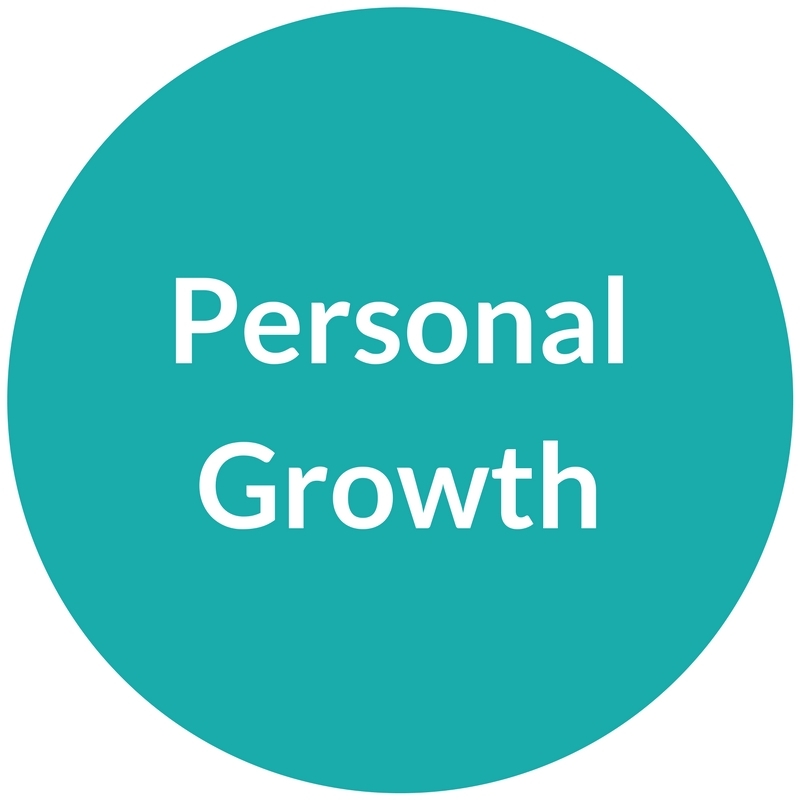 Not everyone has friends with a growth mindset to meet up with monthly the way I do, yet I know the vital role this plays in personal development and reaching big and small goals. When you work on your Project Me with others you lift each other even higher and achieve things you might never do on your own. Believe me! 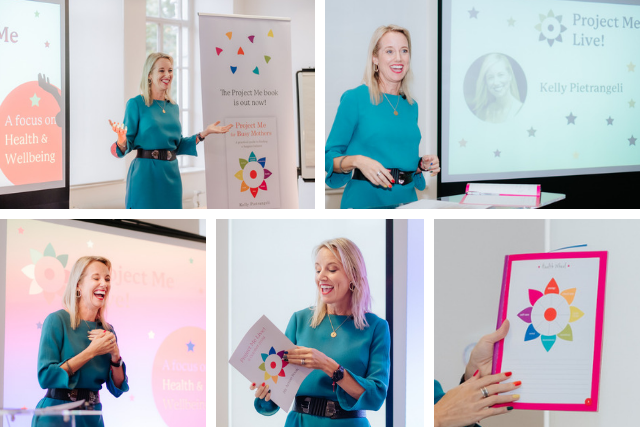 This is when I made my big, exciting announcement: The launch of Project WE, a private members club for women to work on their Project Me alongside other like-minded women with a growth mindset who want to live their best lives. It all takes place online so women can join from anywhere in the world. It includes a private community for support, camaraderie, motivational calls to action, and regular challenges to create positive habits which support your dreams and goals. 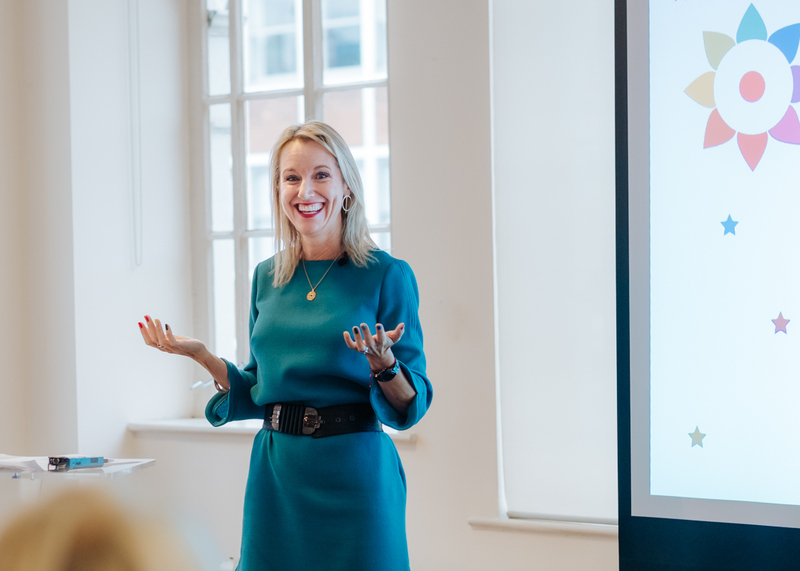 I’ll host an online interactive workshop every month and bring in guest experts in all life areas to help you to succeed. I have so much to give and creating this membership community means I can do that without having to price and package it up separately. 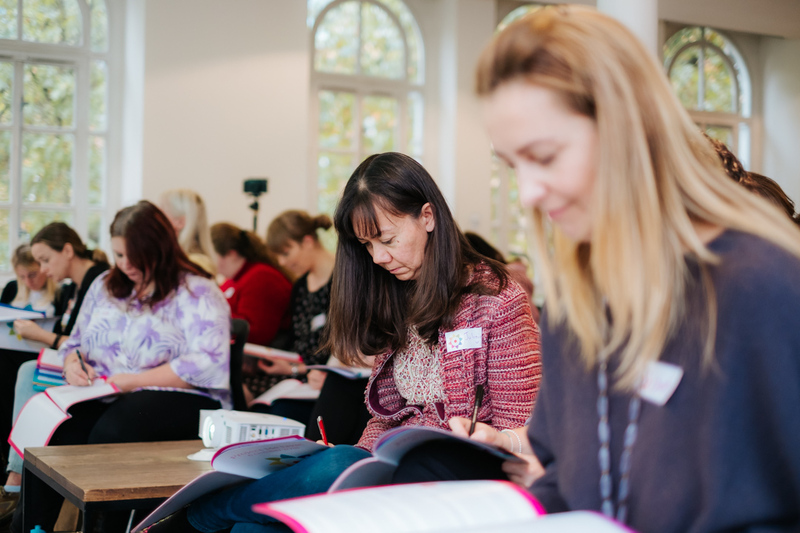 As a Founding Member you’ll join for a low monthly fee of only £19 ($25 USD) a month which is incredible value, and yet demonstrates an important investment in yourself and your personal development. 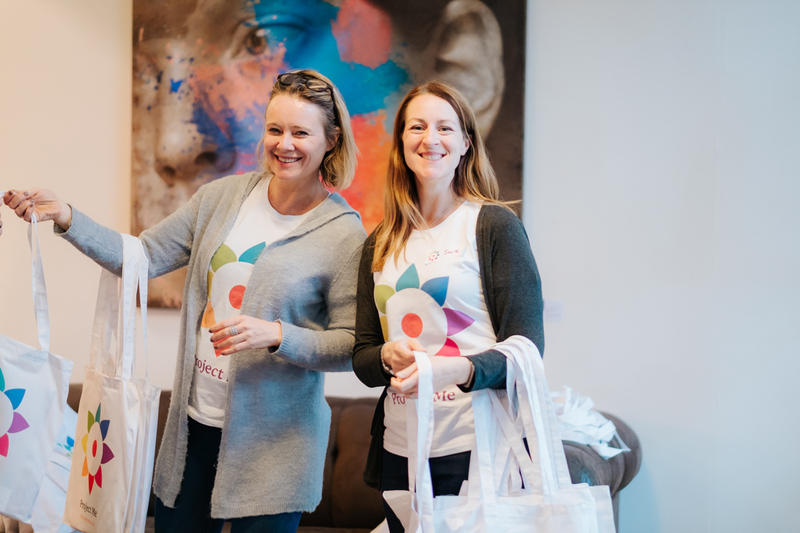 I love helping self-aware women with a growth mindset to shine – and Project WE will facilitate a collective consciousness in which we can learn and grow together. 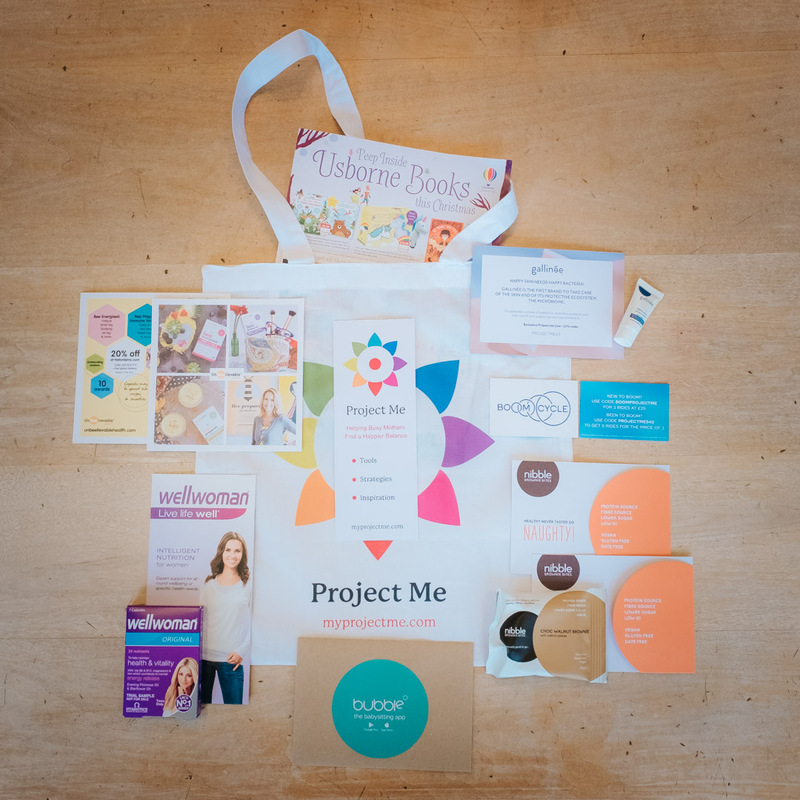 As the event drew to a close, Project Me goodie bags were handed out which included Wellwoman Vitamins (which I’ve been taking for 25+ years), yummy Nibble Brownie Protein Bites (healthy never tasted so naughty! ), Gallinée nature hand cream (an act of self-care), Boom Cycle Vouchers (I’m a big fan of Boom spinning studios), Bubble Babysitting app gift cards loaded up with £10 credit (yay to more ME time! ), and a lovely discount on Unbeelievable Health products. 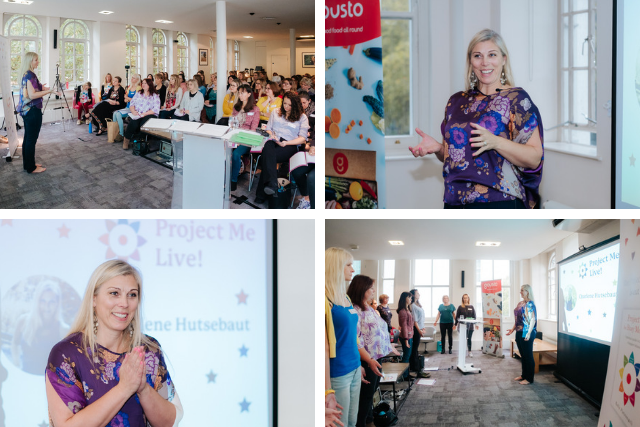 A huge thanks to everyone that came to Project Me Live! If you’re interested in attending a future Project Me Live event, hop on the newsletter list below to stay in the loop. And if you’d like to learn more about becoming a member of Project WE (no matter where in the world you live), click here. 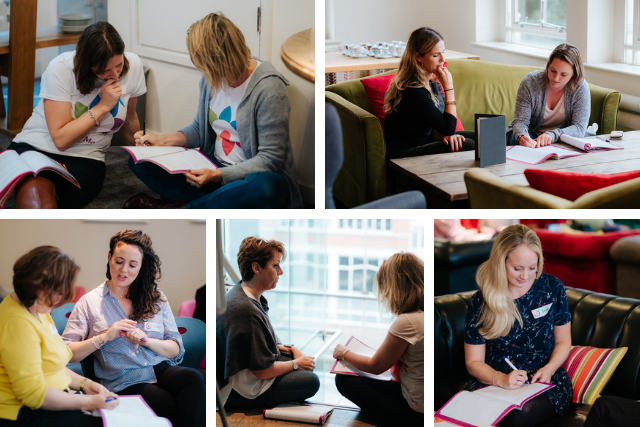 In the comments below, share your thoughts on connecting with other women to work on your Project Me together. 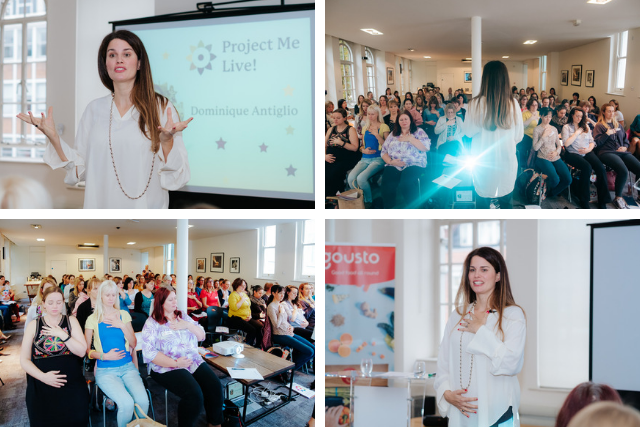 Did you attend the Project Me live event in London? How do you feel about Project WE and attending virtual workshops from your own home? I’d love your input! I was there and loved every minute! Please do it again as I’ve been telling so many people about what an amazing day it was. I will sign up for Project We too. Can’t wait!!! Thank you Charlie. Yes, I’m proud!!! I had such a wonderful time with you all and what a great line of of speakers you pulled together Kelly! I was honoured to be with you.